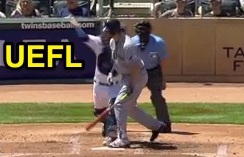 HP Umpire Will Little ejected Rays Hitting Coach Derek Shelton for arguing a strike three and delayed interference call in the top of the 2nd inning of the Rays-Twins game. With one out and one on, Rays batter Steven Souza, Jr took a 3-2 fastball from Twins pitcher Tyler Duffey for a called third strike and baserunner R1 Steve Pearce was caught stealing second base after the just-retired Souza nearly stepped into Twins catcher Kurt Suzuki's throw to second, resulting in an interference call during which Pearce was retired. * Replays indicate the pitch was located over the outer half of home plate and waist high (px .585, pz 3.139 [sz_top 3.740]) and that all other pitches during the at bat were properly officiated—since the runner was retired, the question of interference is ignored, the call was correct. At the time of the ejection, the game was tied, 1-1. The Rays ultimately won the contest, 7-5. This is Will Little (93)'s first ejection of the 2016 MLB regular season. Will Little now has 5 points in the UEFL Standings (1 Previous + 2 MLB + 2 Correct Call = 5). Crew Chief Ted Barrett now has 4 points in Crew Division (3 Previous + 1 Correct Call = 4). *Rule 6.01(a)(5) states that, "Any batter or runner who has just been put out, or any runner who has just scored, hinders or impedes any following play being made on a runner. Such runner shall be declared out for the interference of his teammate." This is the 66th ejection report of the 2016 regular season. This is Tampa Bay's second ejection of 2016. This is Derek Shelton's first ejection since May 10, 2015 (Mike Estabrook; QOC = Y [Check Swing]). This is Will Little's first ejection since June 2, 2015 (Lloyd McClendon; QOC = Y [Check Swing]). Wrap: Tampa Bay Rays vs. Minnesota Twins, 6/5/16 | Video available via "Read more"